I got a Fitbit for Christmas 2017. Firstly, amazingly, SlaveToFitbit.com is available. My legs ache when I do lots of walking or standing but rarely when I run. I easily get obsessed over data. That obsessive behaviour can be positive fuel, but also can be bad. I learned how to think about walking as a part of my regular travel plans. I love a challenge. Last year I entered a 10 week challenge at the gym and that really helped kick things off with my weight loss. I had started, but that really got things going. I didn’t win the competition but I was one of 4 runners up and I took that as a big success. By the end of the year I had stalled and needed new motivation, a new challenge. Getting my Fitbit, the natural challenge seemed to be to aim for 10000 steps every day. The Fitbit ecosystem is very much built around that, and has step competitions you can do with friends and people your friends have invited. I set my goal and got to work. And it WAS work. I had to get my steps in. I can tell you that it takes just under 2500 steps from my flat to the train station. It is 1500 to the golf shop (AKA Pokestop) and back. A brisk 30 min walk is around 3000 steps. I started planning my day around it, where I’d park, if I’d need to go out for an additional walk or not. I knew the numbers. I went for walks. The day I realised how many of the numbers I knew and how much it was affecting my daily planning I googled slavetofitbit.com. I was surprised to find it available. Side effect, I got achy legs again. I’ve had “bad legs” since I was a kid. I’ve been told by many a doctor that it’s growing pains but at 34 and 5 foot 2 and a bit, I don’t believe them. I’ve never really believed them. My own investigations and Dr Google gave me a diagnosis of restless leg syndrome. There are different kinds of RLS, I get the painful kind. I get the kind that had me in hospitals as a kid getting tests to see if I had childhood arthritis or not. Thankfully that wasn’t it. Since the start of the year I’ve had a few episodes of “bad legs” and many days although I’m not having a “bad legs” I’m way more aware of my lower limbs than anyone should be. Dull ache. The only thing I have changed since December is the walking. Also, any day where I’ve had to stand for long periods will end in “bad legs” but that has always been the case. Weirdly, running doesn’t seem to have any effect and over the last year I’ve done rather a bit of that so I’d have noticed by now. Anyone who knows me knows that I am a fan of data. I love a spreadsheet. Thankfully I have not gone down the spreadsheet route with this. I have nipped some of the obsession in the bud. When I left the other half in my flat with the instructions to “play computer games until I buzz” I realised I’d gone to the bad place. His back wouldn’t have been happy with the speed I was walking, hence giving him game time. We don’t get as much time together as I’d like so realising part way through this very quick strut that I had made the choice of steps over romance saddened me and sealed the deal that it would be January only. Funny part to this story, I realised this and came home; I was at 9000 steps. He sent me back out to finish because he wanted to be supportive and knew that the vein in my head would twitch being so close to a goal. I went round the block and came back timed so it would buzz as I was getting to the couch again. I told him then I’d decided it was for January only. That was January 31st. So far this sounds like a very negative experience, but I have some positive take aways too. I discovered community centres, parks and more that I didn’t know were there, all within walking distance of my home. I worked out that there is one affordable (if you know where to get your ticket stamped) car park in Edinburgh that I can use as a centralish hub and walk to different bookings from. That wouldn’t have occurred to me before. I also figured out that many things I automatically drive to I can walk to faster than I thought, so maybe I should walk after all. So far, as I write this on the evening of 8th Feb I have reached 10000 steps 6 out of 8 days in February. But now it is a nice side effect of other activity and not the goal itself. February has other projects now, but that is a blog post for another day. Hiya again! Just a quick one today, I have some knitting to get back to before bed, and a cup of tea with my name on it. 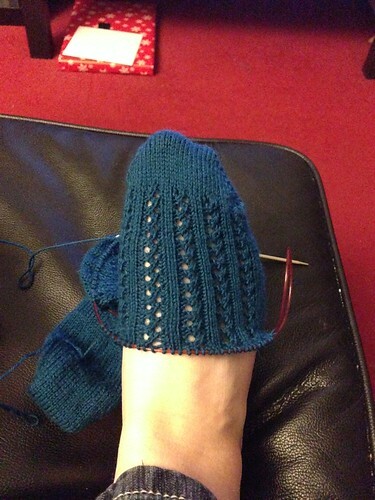 Yesterday knit the heels on my current sock project. I did something that I’ve never done in all my knitting career before. I inserted a lifeline at the end of a section before moving on to the next part. For those who don’t know knitting or what a lifeline is: a lifeline is an extra piece of yarn that you thread through the stitches on your needle, that way if you need to do the unthinkable and rip back your knitting you can go back to the point you’ve saved with your lifeline. when you unravel what you’ve done (crying optional) you get to the lifeline and all the little liberated stitches are nicely perched, waiting to be picked back up. That lifeline felt like defeat. It felt like I had lost trust in myself. And then… then I felt free. I didn’t want to have to go backwards but if I had to, it wasn’t a disaster. I didn’t manage to update this blog yesterday. When I got home from work I was good for nothing other than watching some tv, making my first batch of frugal homemade yogurt and continuing to not be able to get to sleep when I need to. Work left me exhausted. Thankfully I have some good people I could talk to about it. I was a little sad going back to work, not because I don’t like my job. Quite the opposite really. As long time readers of this blog might know, I am a self employed sign language interpreter for part of my week and I am a lecturer in a college supported learning department teaching students with various learning disabilities the rest of the time. I love both of my jobs. I’m very lucky. What made me sad was when I arrived I was met with what can only be described as wall of sign language. I got the impression that the student I work with that day had had very minimal communication in his own language during the two weeks we were off. He has a lovely family, they are doing the best they can but they don’t seem to have as much support as they could have. The student (my student) deserves more. He deserves good Deaf role models to help show him how to make the most of what he has. He is a bright boy who finds some things difficult. I hope he will do well and get enough support when it comes time for him to leave the college environment and I’ll do all I can to make sure that happens. 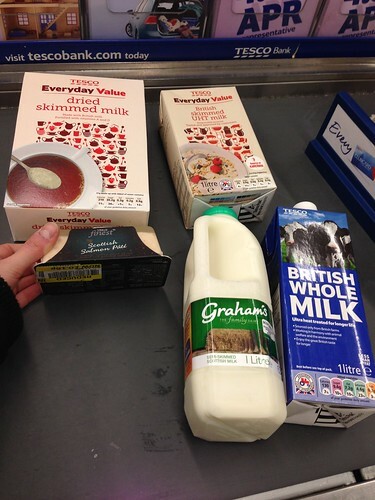 Yup, you are looking at 4 different kinds of milk… The regular Grahams semi-skimmed is for tea, coffee cereal etc. The whole milk is UHT and was to make the first batch of yogurt. 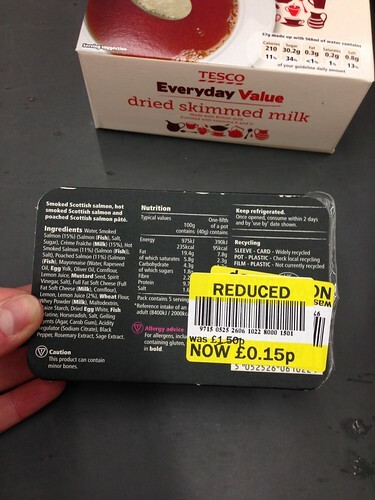 I wanted to used what seemed to be the most foolproof method first and that meant using the whole milk (93p for a litre) and a couple of table spoons of the dried milk to make it thicker that meant getting the dried milk too (£1.15 for the box above). If that worked well I also wanted to try the lower fat and even cheaper but less foolproof method, using skimmed UHT milk (57p for a litre). I checked the 93p version of skimmed and the 57p skimmed milk, the ingredients and nutritional data were exactly the same, only different packaging. Yay! But that meant 4 different kinds of milk… I looked even stranger than normal! The other item you see above is one of my favourite things, salmon pate. You can probably see the yellow “whoopsie” sticker on the bottom. I couldn’t resist. It was only 15p! I had it with dinner. And with that I better get back to finishing my lesson plan for tomorrow. Well, yesterday’s plan of an earlier night and early morning failed spectacularly. I was still awake at 3.30am and didn’t get out of bed till midday. Tomorrow morning is going to be a struggle. I’m glad I’m going back to work tomorrow, holidays are good but I’m ready to get stuck back in now. I wish I’d done more prep for the day job over the holiday but I didn’t, and there is nothing I can do about it now. I have enjoyed the last day of this break. I haven’t done a lot but what I’ve done was good. 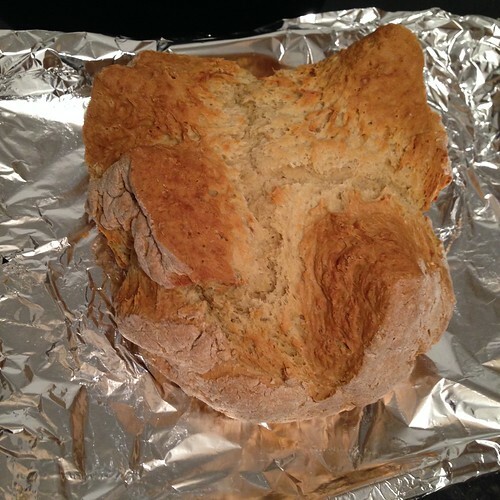 I have knit a little, relaxed a lot and made some soda bread for tomorrows lunch. I used my homemade yogurt. It will be eaten tomorrow with my homemade soup that was made with proper chicken stock boiled up from the carcass of a roast chicken. I’m serious, I don’t even recognise myself anymore! I’ve never really enjoyed this kind of thing. I’ve been faux frugal because I felt I had to be. Now I am being properly frugal because I am enjoying the cooking and the not spending money. It’s becoming a game. I have no idea how long I can keep up the “good life” but I’ll run with it as long as I can. Tonight I really don’t have a choice. I have to cosy myself up and get some sleep. I really don’t want to be grouchy to everyone on my first working day of 2014. Today started the slow powering up again into this year. I’ve found myself slipping towards nocturnal during this holiday. I think that has been made worse because of the amount of sleeping I did while I wasn’t well last week. Basically what is happening is I am finding myself with the most energy from 9pm onwards and around 1am I suddenly want to fix ALL the things. I start back at work on Monday, I can’t be staying up until 2am and waking up at 11am. Tonight I will be forcing myself to go to bed at 11.30pm and setting an alarm for 8am. It will be hard but hopefully it will help come Monday morning. I have gotten a few things done today, not as much as I’d have liked, but I did get some documents up to date, write a letter that I’m now going to sit on for a day or two before sending, finish a piece of homework, did a little bit of knitting and a bit of batch cooking. I would first like to report back about yesterdays yogurt making activity. I hail this a success. It looks a little lumpy there, it was a teeny bit lumpy but I gave it a stir and it is tasty, mostly smooth and lovely! It tastes so fresh. I am looking forward to trying it the frugal way too. What you are looking at above is a massive pot of mashed potatoes. 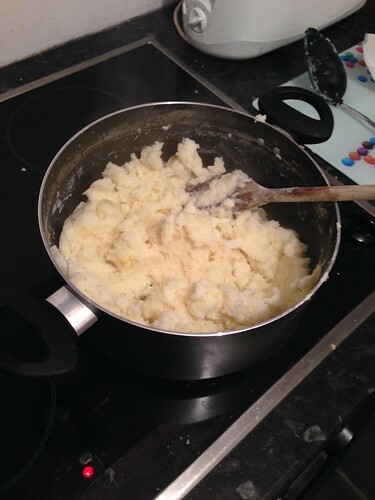 Why would I make a massive pot of mashed potatoes? Well, number 1 reason is “I can”. I asked for the large soup pot for Christmas (yup, I’m that person) and the second reason is I had a large amount of potatoes that were looking rather past their best. 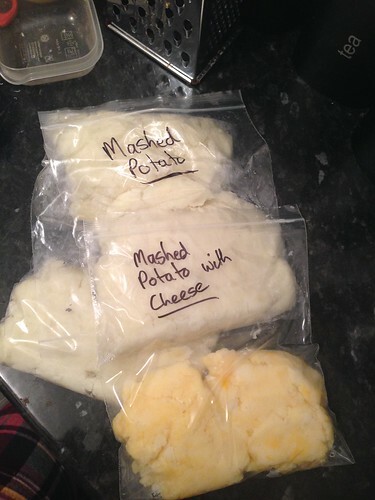 I decided to make mashed potatoes and have now frozen generous portions. Dinner tonight included cheesy mashed potatoes. It’s worth noting that my masher has gone walk-about (after a paper-making “activity” at work) so this was all mashed mostly using just the back of the wooden spoon. Right, it is getting close to my self-enforced curfew. Time for bed and another day tomorrow! It’s been a mixed day. Another day of not getting anything done. I really can’t have another day like this tomorrow. It has been so wet here that there have been talks of gathering all the animals in pairs… you know, just in case. The crazy weather meant cancelling plans I’d had to go and visit Kersti. That felt rubbish. I’ve been on holiday from work for a couple of weeks now. I go back to work on Monday and thanks to having what I think was the flu and the general stress of Christmas and New Year, I don’t really feel ready to go back yet. Two more days. I hope to make the most of them. I saw the Man-shape briefly today, I ran him in for an audition. He got the job so that perked me up again. I also wandered aimlessly round the shops for a little while. I don’t really do that often, I hate shopping as a general rule. Although, I have been known to spend a ridiculous amount of time in supermarkets. During my shopping I bought myself a treat. I am a strange human and to me a treat can be one of two things, something hideously unhealthy and cheap or something that will help me be save money and be healthier at the same time. There isn’t really a mid point with me. I bought myself an Easiyo yogurt maker. This time I am cheating and using the sachet but in the future I am most likely going to experiment with the frugal way of making yogurt, UHT milk and a yogurt starter. 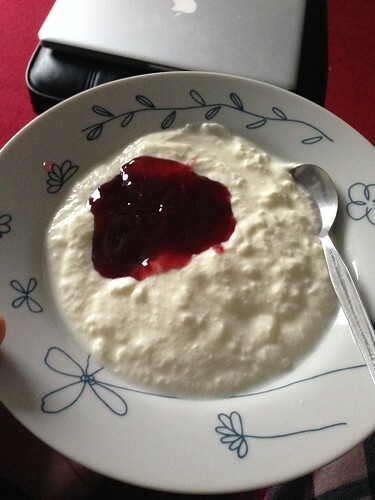 1kg of yogurt for ~£1. (it would cost more than double for the Tesco own brand equivalent). I will be sure to add a write up of my first cheat batch of yogurt and of course a tutorial of the old school method when I have figured it out too. I have been having some issues with my digestion for a couple of months now so I am hoping a small dose of healthy bacteria every day will help me a lot. I’ve not been buying yogurt that often because is feels like there is never a decent shelf life on the shop bought stuff and I ended up having to throw a lot away which was just a waste. I am hoping that this is a new chapter in a healthier me. I also can’t wait for that moment when I use my homemade yogurt to make homemade soda bread to eat with my homemade soup! I don’t enjoy cooking really, I have to force myself to do it. But this is all starting to look scarily like fun. Who the hell am I?! The other reason for the yogurt maker (other than an unusual way to spend my Christmas money) was to really think about how to stretch my money as far as possible. Making my own yogurt won’t make me a millionaire but it does make me more aware of where my money goes. And it sort of turns it into a game. I like that. In the last 6 months I have begun the journey (again, properly this time) to pay down any debt I have. I want to have experiences, go on holidays, buy new clothes, not have to settle, and generally to feel free in my life. I personally feel that any debts at all, even cheap debts like my remaining student loan, stop me from doing that. Part of tomorrows plan is to figure out what has already been paid so far, and what bills that might be put off, become debts and cost me more, have been cash-flowed in that time. I will hopefully add more info here about that when I know the numbers. Today I relaxed. No really, I relaxed. I thought I was relaxed before but it turns out I’m not actually all that good at it. I have to force myself to relax which I am sure defeats the purpose. I have been pushing really hard towards the end of the year to finish things because that makes me feel in control (note to self: draft up the “illusion of control” post). I have pushed so much that even when I’ve been “relaxing” I have had a mind filled with lists and business and, to put it in a way my knitter friends will totally relate to, loose ends to be woven in. Now, thinking about it, the loose ends metaphor is a good one. Those pesky ends can teach us so much. Something can look superficially finished but look a little deeper and that lovely stripy vest is hiding a horrible secret. When I was going through interpreter training there is another, related, metaphor that is used by many tutors: Be like swans. Swans are graceful, they glide along beautifully and look calm… on the surface! Underneath they can be paddling like the dickens to stay afloat and we’d never know. Be like swans, when your brain is running a sprint, remain calm and look graceful. Easier said than done, but some people are masters of it. Ever had a friend drop the bombshell that they are really struggling but you had no idea? yeah, that. Back to the stripy vest, it looks done on one side but it’s not, it needs the ends put away and finished properly. If you don’t finish it properly and then try to wear it, you know what will happen, it will unravel and that shiny finished exterior illusion is blown. Hmmm, my current interpreter professional development has me focused on freer translations and that means really understanding the meaning of the English to get its essence to achieve the best translation. Apologies if that leads to the over-analysis and subsequent killing of any metaphors in the process. But still, the above metaphor is good for explaining what I’ve been trying to do lately. I am a master procrastinator. I’d have awards to show you to prove it but I didn’t make it to the ceremony because I found other things to do. That procrastination builds up unfinished things, half finished things, lists of lists and general stressful un-satisfaction. So I decided I’d had enough. I split my massive “To do” list into smaller lists by subject area (I didn’t say I was stopping procrastination completely). Each of these lists started rather long but I would just take one achievable task from one list and hammer it out until it was done. Some of them were quick and easy, some took more time and planning to complete. But now, about 3 weeks on from the list separation and I feel like this is a system I can use indefinitely to keep on top of things. It has slowly given me focus and drive, but that meant I was always “on”, if you know what I mean. There are still some nastier things that I am putting off from my lists (that I shouldn’t be) but it feels good seeing each one shrink even if they are rolling lists with re-growth. How was today different? How did I relax? I did relax for most of today even if not as deeply as I perhaps will in future. I don’t know what made today different, whether I saw it as the Scottish holiday that it is meant to be or something but when I couldn’t do my first choice activity today (spend time with my mum) I chose to spend time on me. I cooked. I used up some past its best veg to make a very tasty pasta dish. I don’t really do recipes as such but this was really tasty. I don’t know how much it cost per portion but I now have one large portion in the freezer, one snack size and one regular size in the fridge. I fried off the chicken until sealed, added the onion, leak and then pepper. 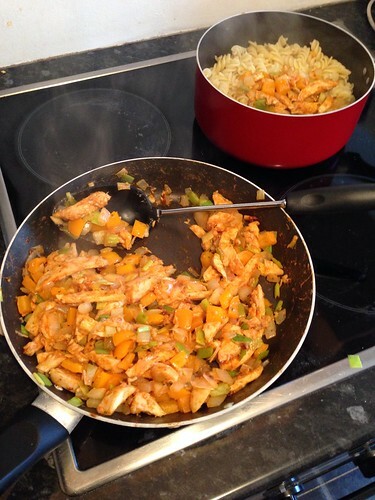 When that was all cooked I added the garlic and fajita mix and cooked for another couple of minutes then mixed into some cooked pasta. 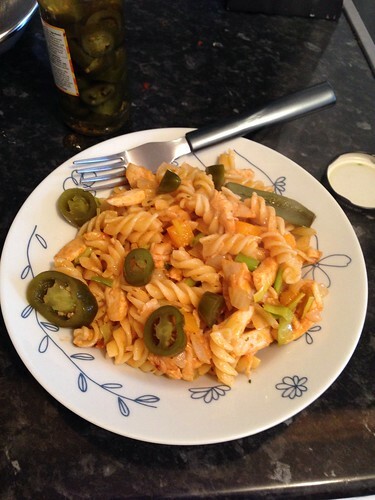 For extra kick I added jalepenos. I baked. It’s not new years in Scotland without shortbread so I made some of that too. I pottered, cleaning and tidying the kitchen as I went. I watched some shows on netflix (currently watching Vampire Diaries). I knit. I am so close to the heels I can nearly taste it! 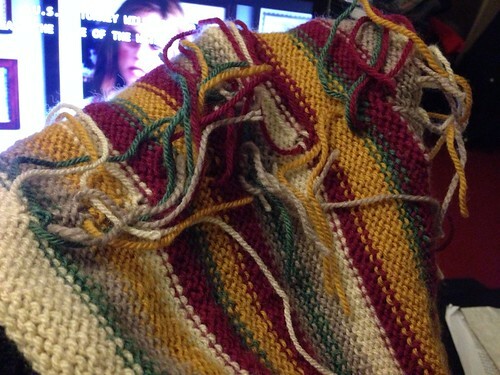 I am bored of this pattern though. Ironically I think I would have been less bored if I was knitting a completely plain sock that just went round and round… I could focus just a little less on that. It would be nice. For a day, I just was. I didn’t tick off anything from my lists. 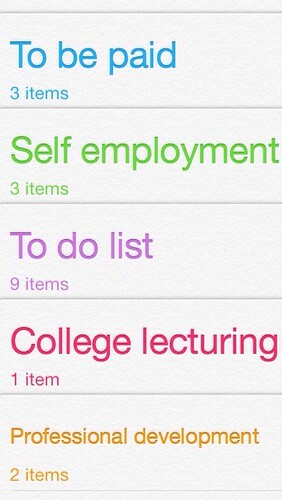 I didn’t write up the goal/resolution list that has been rattling around in my brain for a few days. I just was. And it was completely needed. ps. The all ends on the stripy vest were sewn in and it was worn for the first time yesterday.